Enter an oriental palace of golden tones and an elegant environment with a luxurious interior. At OCCO, we serve Lebanese small dishes known as mezze with fresh ingredients that will thrill your taste buds! Our beverages consist of local wines and cocktails, including our signature saffron-drink. OCCO is a world it's own with both local and international atmosphere - an experience that encapsulates the mysterious essence of the orient. The 2019 season welcomes you with two new offers: à la carte options and a bar menu to accompany delicious OCCO cocktails. Should you wish to have a full Lebanese experience, you can still choose between our three traditional set menus. All our cuisine is carefully prepared using genuine products, traditional techniques and authentic exceptional recipes. We serve first class Lebanese wines, and we are the only Spanish restaurant to serve the Chateau Heritage Family Reserve wine. You don’t have to go out to enjoy our menus – Bring in the food, to yourself, your friends and family or colleagues. Are you looking to host your next meeting or birthday? We cater for every event, every occasion and to your personal preference. It is our mission to make every event a celebration and we look forward to meeting your request. 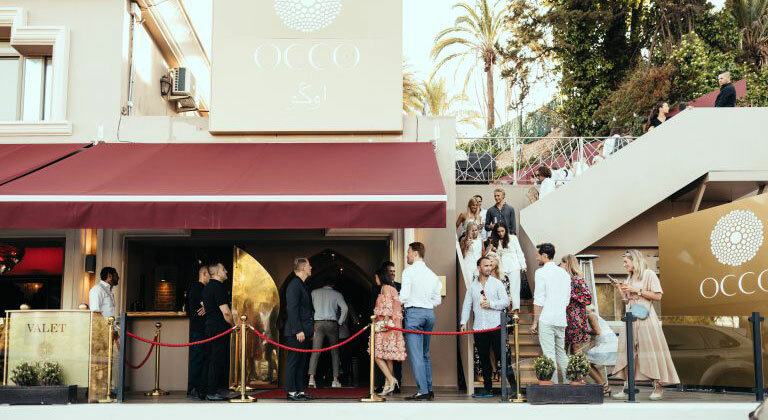 Please contact us at marbella@occorestaurant.com or please call us on +34 689 59 38 79 to discuss your catering & event needs.